It's Vallejo German Orange with a splash of Deep Yellow. It could be more vibrant but I reckon it'll look good with the meatballs on top of it. Decals tomorrow followed by another coat of shiny on Satyrday and final assembly and pics on Sunday. Nothing like sneaking it in just before the deadline. No stuff ups so far so i'll either snap off the undercarriage legs tomorrow while decaling or grab the wrong can and give it a coat of white primer on Satyrday or drop it on Sunday. Ohhh glorious!!! I love it already! Obviously I failed to predict the exact stuff up. I should really have realised that 40 year old (can 1977 really be that long ago? I feel so old) Hasegawa decals could refuse to leave the backing paper no matter how long they were soaked. Shame as the designs for the vertical tail looked pretty good. Never mind, I had a rummage in my decal folder and replaced most of them with something similar. It doesn't show in the pictures but those meatballs are a touch translucent. 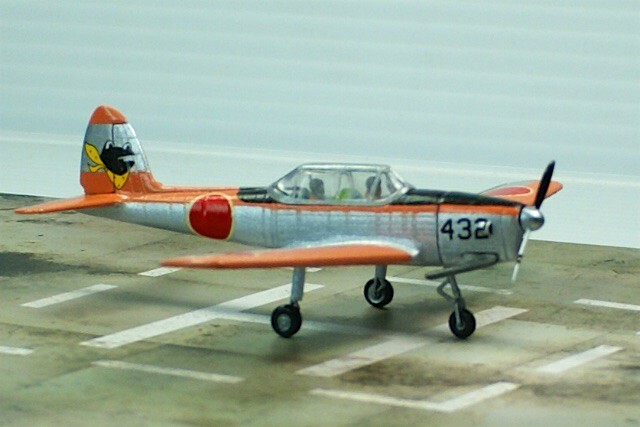 They are from a Hasegawa T-33 that is of the same age as the T-34. But they came off the backing. Numbers and frog are from a much newer Hasegawa Phantom. Wheels on and moving surfaces are pin washed. Off to the shed with the camera now to take photygrufs. 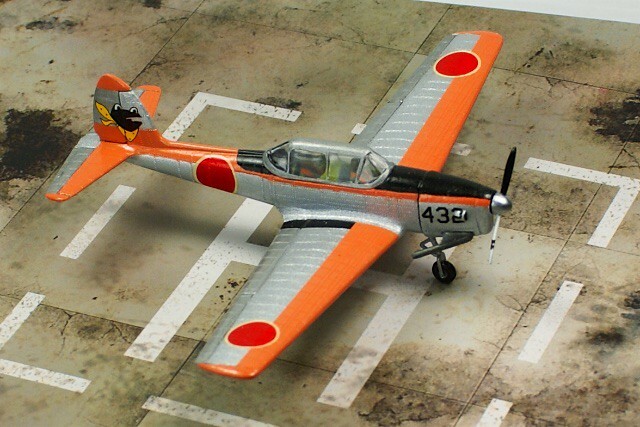 What if, when searching for a piston engined trainer the JASDF had approached De Havilland Canada and requested they produce a version of the Chipmunk with a tricycle undercarriage? The result? 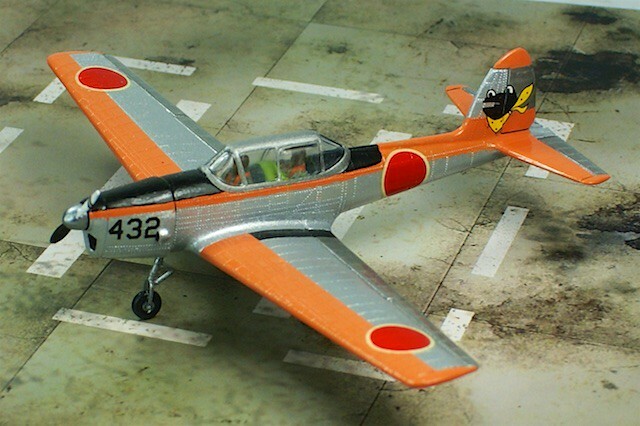 Instead of purchasing the Beechcraft T-34 Mentor the Japanese procure the Chipmunk T-100. 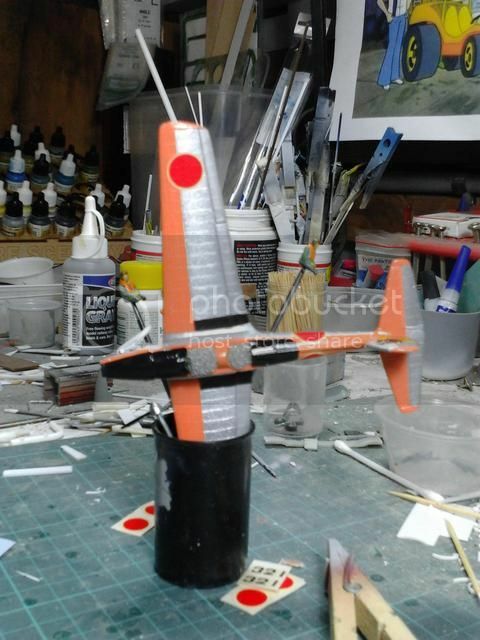 Airfix 1/72 DHC Chipmunk T-10 (mmmmmm, all those rivets - luvverly ). Nose gear from Academy P-39. 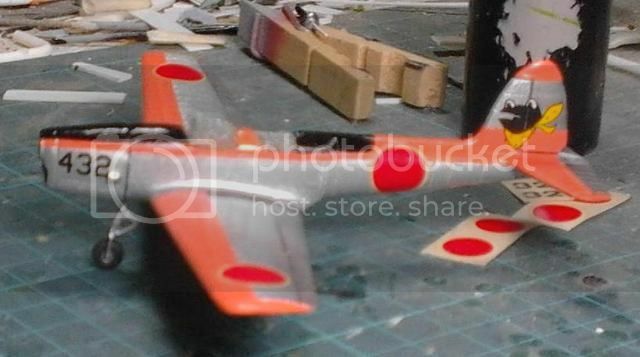 Paint job as per Hasegaewa T-34 instructions. Decals from Hasegaewa T-33 & F-4EJ. I like that very much! Nice colour scheme. Looks Good! Can't believe how much that change of stance changes the look of the aeroplane ! If I hadn't been following the thread I'd have trouble guessing what it was. Great stuff. Fantastic!! This is super clean and awesome. Now that is indeed something you don't see very often. I love the colour scheme and putting up a Chipmunk on three wheels feels like a circus trick. Very nicely accomplished, that's for sure! Nice one! 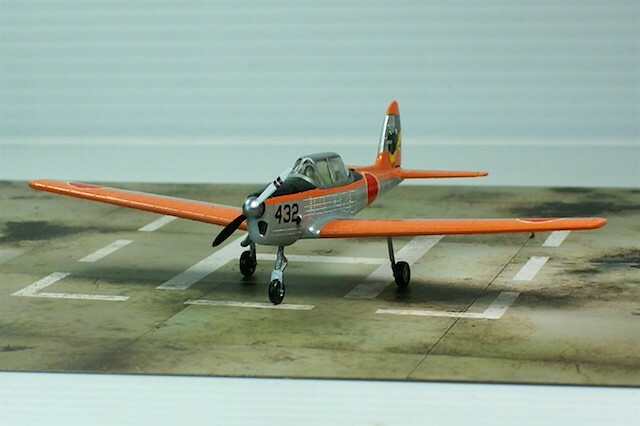 The nose wheel looks good and the paint job really suits it. Awesome job! Funny how much better I like this with the tricycle gear.